Ever wonder how far you could lean a roundcase twin? 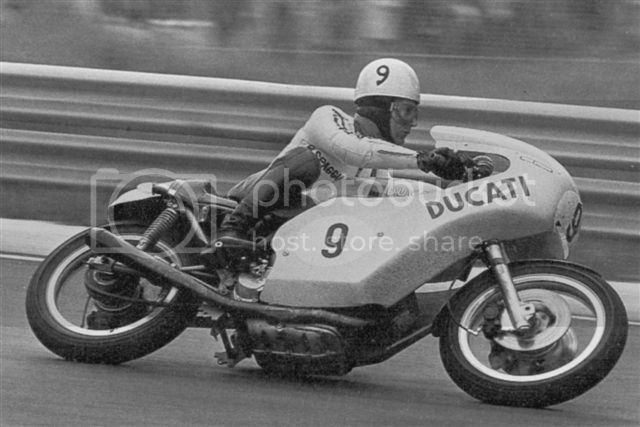 I love this photo of Bruno Spaggiari on the 72 bike. That's a great photo. He didn't have much choice;nor did Paul Smart,(quoted in Cycle Magazine:"what a heap on the twisty bits!") or anybody who ever raced that Longlegs 59-60 inch chassis. A year later the wheelbase on a batch of the workshop racers was reduced by(4?) inches! Those got leaned over just as much,but with a lot better results and a lot less effort and problems. That conversation was followed by quite some grumbling about having sold it! 1. How much Spaggiari is out of the seat, yet I've often read that he was more 'Old Skool', i.e. more Hailwood-style. But maybe he'd picked up something from that Smart bloke by the time this photo was taken ?... . I note also how neither of them are clamped on with the outside leg, like wot we're taught to do these days . 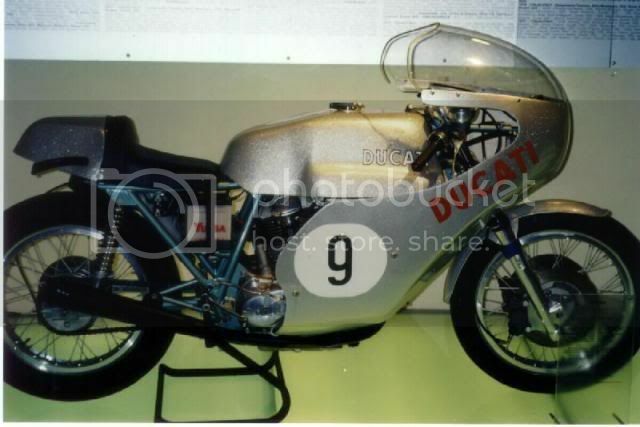 Btw, do you know is this the bike that is now in the museum, i.e this one? Yeah. As you would know, Spaggiari had already had a long history of racing by this time, and mostly on singles, and he was generally speaking considered "Old Skool". I guess tyre technology had moved on a bit too, and by 1972, the were a number of leading "out of the seat" riders around. That being said, we've both commented on Pete Mille's Hailwood video tonight - He's won at Mallory on a 78 SS with his bum pretty much glued to the seat! Your PS photo is LHS. I can only tell you what George told me the other night..."You had to ride it with a frog's leg around the high pipe...that thing got hot! You could only get your foot on the outside half of the LHS peg comfortably, and had to point your foot inside for the brake." No. I know George sold Bruno's bike to a guy in the UK via an agent, and I have a photo of the new owner and Paul Smart with both bikes at one of the UK circuits (Paul didn't run it, it was for display only). Last I heard the UK guy sold it to someone in the US. Which museum? 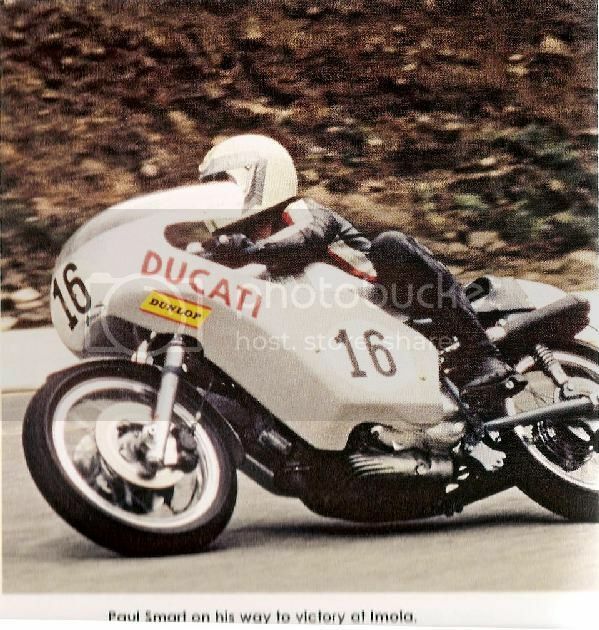 I remember reading that one of the 2 Imola bikes was given to the Oz distributor to race,Kenny Blake rode it for a while.Ron Angle was the Oz distributor,no personal knowledge,just what I read.No idea how or if it ended up in Western Oz. Yes, Ron Angel bought it after Imola (I seem to recall reading somewhere that he copped a bit of flack from his wife over the price at the time, so I don't think it was given to him). Kenny Blake did ride it for Ron Angel. It may have gone through a few hands after Ron, I'm not sure, but I know that George drove across Australia and picked it up from Bob Brown in Melbourne in 1979. Plenty of opportunity to anticipate on a drive of that distance - I doubt the speed limit was adhered to in either direction. Rediscovered yesterday...the agent was one "Steve Wynne". Need a Canadian along? I could be up for that - I've been thinking about a trip to France as my french is getting rusty. The Pyrenees are on my favourite places list. Plenty of time to get prepared Bruce! A few of us are planning on circa end May/Jun 2015 and we'll probably take in the Motogiro beforehand depending on how the route looks for 2015. You'd be more than welcome to join us. A French speaking Canadian would be very handy for any discussions with the Gendarmes. Craig, of course, speaks French like a native, but I wouldn't put it past him to be putting the finger on his riding partners in such discussions. Besides which, he tends to be busy retracing our steps to find stuff that I leave behind. abmartin wrote: Need a Canadian along? . Fair point, Craig. I agree it is important for Bruce to be fully aware of all the implications. Mind you, with a name like "Bruce" he apparently should fit in fine. Funnily enough, I don't personally know any Australian called "Bruce"! Nor an Australian girl called "Shirley"! I know personally one person of each name, but both from Scotland! I thought the Aussie joke name for women was Sheila not Shirley. In any case I've spent lots of time with people from down under. The ski hills in western Canada are full of them during winter and I've traveled with a fair few in my several years spent in Europe. I've joked that I've come back home with an Aussie accent after spending a winter skiing.